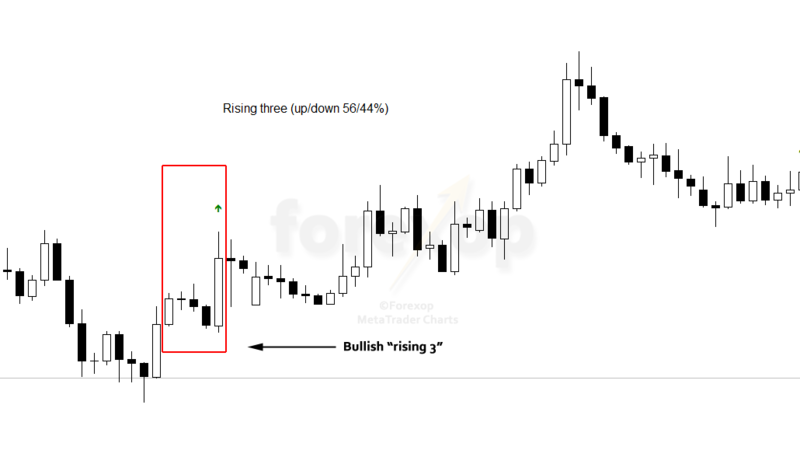 The “rising three” is a chart pattern that many traders assume will lead to continuation of a bullish trend. It’s useful when trading on a rising market. This chart formation is the opposite of the falling three, which denotes continuation of bearish trend. 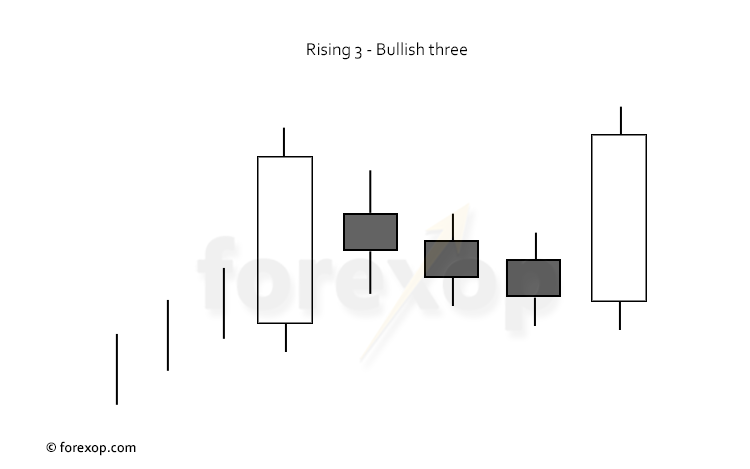 To identify a bullish “rising 3” we look for two long white candlesticks with three black/white candlesticks between. The bodies of the three inner bars should lie within the range of the first white candlestick. The outer or last candlestick must be white and it should close above the close price of the first one. The rising-three pattern means that the market has consolidated and then resumed its uptrend. This cycle is repeated often in most bullish trends. On the first white bar the market is strongly rising. In the period during the middle bars, the market is trending sideways and usually a little downwards. This is a sign of a consolidation rather than a correction. The comparatively small inner bars suggest that the market is not reacting by a corrective downswing at this point in time. Finally at the last bar the bullish trend resumes, often with a volatile bullish breakout. 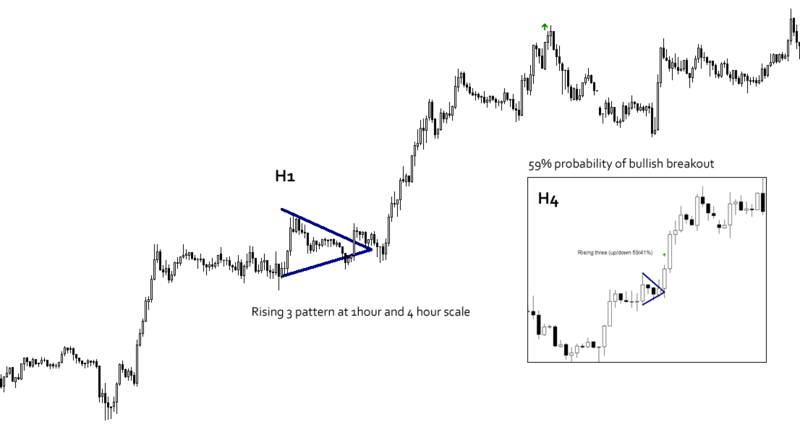 When the pattern appears, most traders will assume a continuation of the bullish trend. But there are several other points to consider. In Figure 2, the chart shows the formation of a typical rising-3 at two different scales. This pattern is identified on the four hour chart. But if we zoom in to the one hour chart we can see a clear wedge/triangle shape developing. Wedges and triangles are generally seen as continuation patterns. They can sometimes trigger a strong breakout when the trend resumes its original track. This is exactly what happens in this example. If we look at the hourly chart, the market begins to break the upper line of the wedge. Once the upper resistance is broken the market falls again to retest the lower support. Double strikes of support/resistance lines are common just before a breakout. Following this there’s a strong bullish breakout and the upward trend continues. Under certain conditions the rising-three formation provides a strong suggestion of continuation of a bull trend. Although like the falling three, at shorter time scales the rising three can have a contrarian bias. That means its appearance often foretells of a market fall. In some cases this can be a short-lived downswing rather than a full trend reversal. For this reason it is always best practice to quantitatively estimate the pattern’s reliability on the chart and time frame you are trading. We do this with a pattern indicator that measures the pattern’s ratio of wins to losses over the chart being traded. While the rising 3 can be a strong signal, one of the difficulties in trading with it is that the pattern can appear at trend tops as well as in continuations. This means when entering long the market is susceptible to a correction that results in a losing trade. The other problem is that of pullbacks. 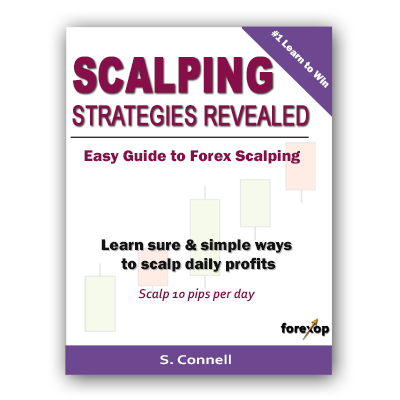 These events are associated with trading breakouts of any kind. Once the pattern completes after the final bullish candle, the market will start to draw down and consolidate again. One of the ways around this is to anticipate the breakout and time the entry earlier. This can be done by looking at the chart at shorter time periods. Another alternative is to use a retest strategy. The chart in Figure 3 displays a rising three formation on a four hour chart. The complete pattern is highlighted with the red box. It starts with the first white candlestick on the left of the box. We then see some consolidation because the market cannot maintain the strong upwards momentum. This is marked by the three inner candlesticks. As the pattern ends there’s a strong breakout rally. This produces a long bullish candlestick when the price breaks away from the consolidation level. Again we would carefully monitor this price action on the lower timeframes. Afterwards we see the market giving back some ground as it draws down briefly in another consolidation phase before the next wave of the uptrend begins. The next example in Figure 4 displays two patterns occurring one after another. In both of these the patterns have a high reliability score (above 60%) because of the pattern strength and the previous chart history. Hi, your explanations are very good. I’ve learned a lot with these guides. But I’m a newbie and I don’t know which step to follow. Is there a proven system? Something that works every time? I’m ready to invest in that. Please let me know. Thanks!